2018 has been an exciting year for perchlet fans. 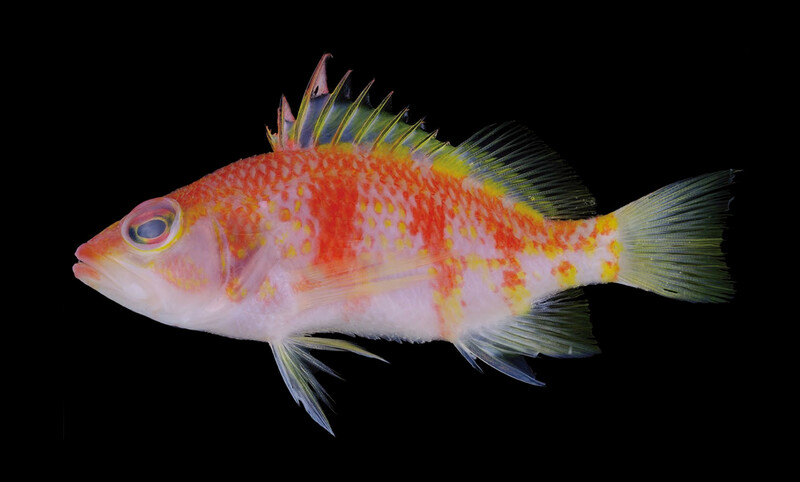 Back in May, we were introduced to an exquisite new species from Easter Island, Plectranthias ahiahiata. 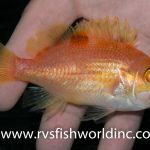 August saw the undescribed “Ubiquitous Perchlet” make its way into the aquarium trade out of the Philippines. 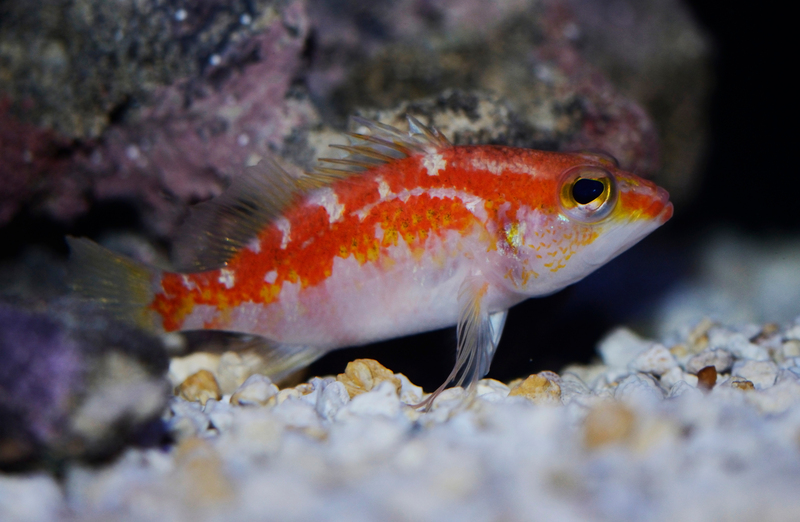 And just this past month we glimpsed the first aquarium collection of Plectranthias randalli from Taiwan. But if somehow that was not enough to sate your desire for small, benthic anthiadines, may I present to you Maekawa’s Perchlet. 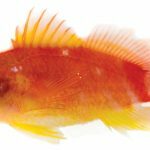 Appearing in the latest edition of Ichthyological Research, Plectranthias maekawa is described based on three specimens obtained from rariphotic reefs (150-200 meters) in Japan’s Ryukyu Islands. The name honors a Mr. Takanori Maekawa of Maekawa Fisheries Co., who helped to provide specimens used in this study, all of which seem to have been collected (with hook and line) as incidental bycatch in this region’s commercial fishery. Uploaded by MrBlueharbor on 2012-01-07. 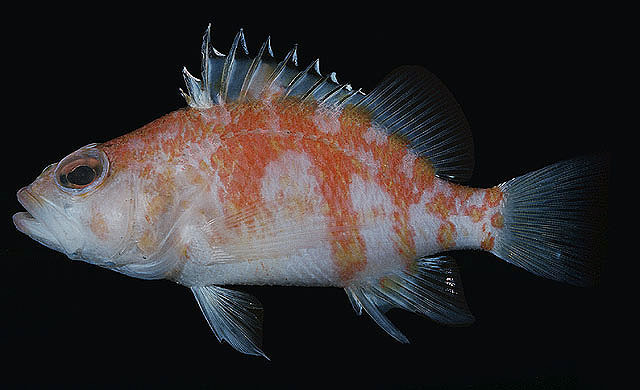 P. maekawa is a relatively small species—the largest specimen measuring just 62mm—and sports several prominent red bands along its sides, along with some scattered yellow accents on its scales and frosted tips in the first few dorsal fin spines. But there’s another species found in these waters that can easily be confused with it, P. wheeleri. There are a number of minor morphological distinctions used to diagnose these two, the most important of which being that P. maekawa is a bit more elongated in its body profile. Coloration is also a useful trait to compare when identifying these two perplexing perchlets. The most notable is the relative orientation of the red bands along the sides. In P. maekawa, there is a fairly wide and well-formed vertical band position midway beneath the spinous dorsal fin, followed by several smaller bands directed slightly backwards. In P. wheeleri, the sides have bands which are poorly developed, often appearing almost non-existent in live specimens, alluded to in its common name, the Spotted Perchlet. There seems to be some amount of behavioral control to how this pattern is presented, with certain specimens only showing coloration dorsally. Also of note is the cheek patterning. In P. maekawa, there is a yellowish blotch beneath the eye and another nearer the pectoral fin, while in P. wheeleri there is a patch of yellow-margined scales stretching from the eye to the opercular edge. 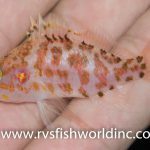 Lastly, the dorsal coloration differs, with P. wheeleri having an intense red throughout the back, marked by several small, white blotches, while P. maekawa has more of the white base coloration showing through and in places has only a red margin to the scales. 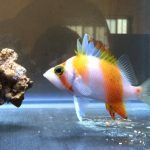 For such small species found at such great depths, it’s a bit surprising that both of these perchlets have on occasion found themselves collected for the aquarium trade. The only evidence I’ve found for Maekawa’s Perchlet in captivity is a single specimen shared in 2012 by Blue Harbor, said to have been collected from Okinawa. A number of individuals of P. wheeleri have been documented coming from collectors in Taiwan and Japan, all seemingly from rariphotic depths. One was kept at Japan’s Churaumi Aquarium for five years, illustrating that these deepsea anthiadines fare quite well in captivity. Another specimen was documented as having changed its coloration quite dramatically from red to orange within the space of a month. 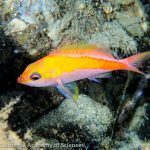 There’s apparently much left to learn about the sexual and behavioral variation in these fishes, though it’s worth mentioning that the apparent sister species of P. maekawa—Hawaii’s endemic P. helenae—has successfully been reared in captivity from its planktonic eggs. These two are suggested to form an allopatric complex in the North Pacific, though it’s perhaps questionable whether they are actually distinct from one another. It has to be emphasized that very few specimens are known for either of these, and, without any corroborating genetic data, the morphological and color differences used to separate them could just as easily be considered intraspecific variability. As is so often the case, the mysteries of the deep seem to provide just as many questions as answers.